A major mishap was averted at the Indira Gandhi International Airport in Delhi on Tuesday morning after an Indigo and a SpiceJet aircraft came face to face on the taxi way. “An Indigo flight 6C-729 which was coming from Lucknow to Delhi with 176 passengers on board, post landing, saw on the taxi way a SpiceJet aircraft in front of it,” Indigo spokesperson said. “The matter has been reported to the Air Traffic Control (ATC) and the Directorate General of Civil Aviation (DGCA),” the spokesperson added. 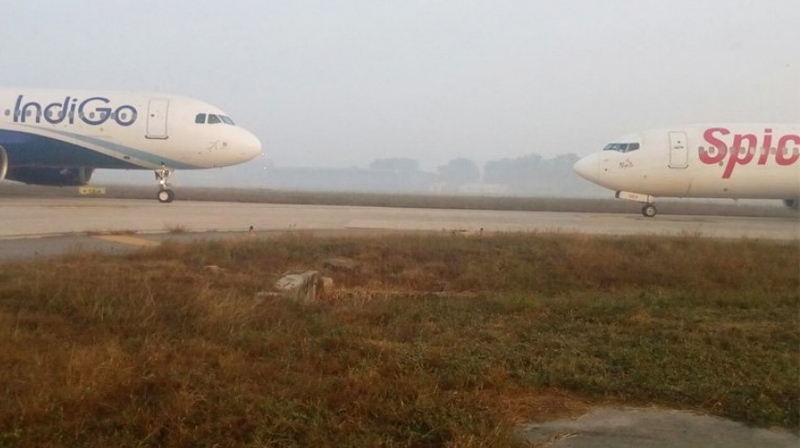 A Spicejet statement said, “SpiceJet flight SG 123 operating Delhi-Hyderabad was following ATC instructions at all times at the Delhi airport.” “While taxing (for takeoff), the SpiceJet crew observed another aircraft on the same taxiway in the opposite direction. Acting promptly, the SpiceJet crew immediately stopped the aircraft and intimated the ATC,” said the statement. “Safety is utmost and primary concern of SpiceJet. At no stage the safety of passengers, crew and aircraft was compromised. All concerned authorities were immediately informed,” the statement said.